Sometimes Trade gives me horrible ideas and I inflict them on other people. Congratulations! You're other people! Gul'dan finds out that when they said 'green energy' they meant renewable, not Fel. Gul'dam. Gul'dan finds the sands of Tanaris far too hot. Gul'fan. Gul'dan invites all his friends over for a big party. Gul'fam. Gul'dan has a very important test tomorrow. Gul'cram. Gul'dan hears about a miracle back fixing curative but it turns out to be a con. Gul'sham. Alternative: Gul'dan decides to reroll as a shaman. Gul'Sham. Gul'dan is found "enhancing" his Olympic althletes with Fel energy. Gul'ban. Gul'dan gets a lucky roll during Brewfest's dungeon. Gul'ram. Gul'dan has to choose fight or flight, Gul'ran. Gul'dan sends you unwanted email, Gul'spam. Gul'dan is making you a hot meal, Gul'pan. Gul'dan lubricates the pan, Gul'Pam. Gul'dan had a great day at the beach, Gul'tan. Gul'dan gets asked if he can bech 200lbs, Gul'can. Gul'dan helps families to the park, Gul'tram. Gul'dan games with his friends all over the world, Gul'WAN. Gul'dan offers you a piece of candy, Gul'van. Gul'dan drives a Corolla, Gul'Dan. Gul'dan blocks off a stream. Gul'dam. 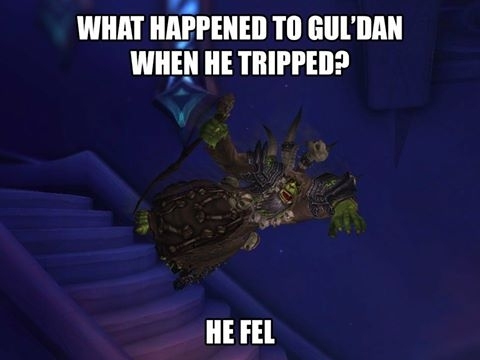 Gul'dan has awful flashbacks. Gul'Nam. Gul'dan brings a computer over to his friend's place. Gul'lan. Gul'dan talks about Sonny's mom. Gul'slam. Gul'dan likes to hang out with 'anonymous'. Gul'chan. Gul'dan is running from the cops. Gul'lam. Gul'dan smells like Fel Spirit. Gul'jam. Gul'dan shoots down an airship. Gul'SAM. Gul'dan redistricts Azeroth to make room for Fel Cities. Gul'plan. Gul'dan was being chased by sharks. Gul'swam. Gul'dan joins the Wonder Twins. Gul'Zan. Gul'dan makes a pun. Gul'Dannit. This thread is Gul'dan hilarious. Total Gul'fan of it. Sorry my format doesn't adhere to the original Gul'plan. Gul'dealwithit. Brian secretly enjoys the hell out of it. There is an item in the game called Flight Master's Whistle. You blow it, and wherever you are, a bird comes and flies you away to another place. @Rootwyrm: "Ha! The flight master's whistle works under water!" Me: "Well, that ruins immersion"
So it's the Eon Fute from Pokemon Alpha Sapphire?